As Microsoft unveiled during its Windows 10 briefing, the new operating system will feature an app specifically for use with the Xbox One. 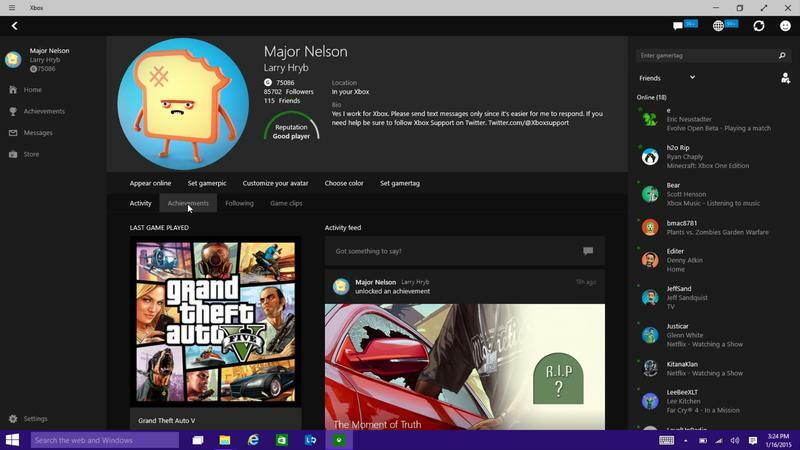 That Xbox app has been previewed by Microsoft's Larry "Major Nelson" Hryb, which you'll find in the video above. In the post highlighting the preview video on the Xbox Wire, Microsoft drops a lengthy rundown of "some" of the features bound for the initial preview release this month. It's actually a pretty exhaustive list, and here it is in full. Following – displays your Friends and also enables you to see games that you are following. You can "Follow" a game by clicking on the Follow button on the game details page. Recently Played – you can see your recently played games, along with your gamer score and achievements earned across all platforms, you can also filter this list down to Xbox One and eventually other devices. When you click on a game, you bring up the Game Hub – where you can see your Gamerscore, Achievement status, Time played and Game clips for a particular game. Additionally, this is where you can choose to "Follow" a game. Activity Feed – you can view your activity feed and post text, like and comment on your friends' recent achievements and Game clips. In this version of preview build, the sharing functionality is not yet enabled. That's a whole lot to take in, of course. So, Microsoft is starting with an early release for the preview crowd. When Windows 10 officially launches with this Xbox app, are you going to try out the fresh new ecosystem? Or, would you rather have your console experience entirely separate from the one on your PC?